Note how different this is from the Tuesday night HORSE tournament at the MGM Grand. I've done that one three times, and you're lucky if you get one player per table who is so easily pigeonholed and conquered. That thing is mostly populated with the city's best lower-stakes mixed-game connoisseurs. I am not alone in this assessment. My friend Brad Willis, a.k.a. _Otis_, played it a few weeks ago. After a short time in the game, he tweeted, "It appears I grossly underestimated the quality of a $120 weekly HORSE tournament." A little while later, he added, "And I mean GROSSLY underestimated." As Bill Clinton might say, I feel his pain. I have never felt that I have any edge at all in that event. The Orleans Friday noon, though--well, let's just say that it's a HORSE of a different color. I was also getting clobbered by the deck: quads, flushes, wheels, etc. So 45 minutes in, I had doubled my starting stack, and I had nearly tripled it by the first break. That isn't terribly uncommon in big-bet games (no-limit and pot-limit), but in limit? Unheard of. This was the proverbial running like God. But all good things must come to an end, and that 3x-stack benchmark seemed to be my upper limit. I couldn't exceed it for another two and a half hours. (When playing a tournament, I amuse myself by jotting down my chip count every ten minutes or so. It makes an interesting record of the ebbs and flows.) By then, I had long since stopped being chip leader, and was just a little above average with ten players left out of the original 25. That dropped to a little below average with eight left. Then with just five left, disaster hit. I made a straight in stud and raised a guy who had been getting out of line more than his demographics would suggest likely. But he reraised me with a pair showing on 6th street. He could see my 6-7-8-9 plain as day, and it did not faze him in the least. I reluctantly concluded that he would only do this with a full house, and that I was therefore drawing dead. It hurt like hell to do so, but I folded, after having invested two-thirds of my stack. He gave me the courtesy show that I had been correct. That made me the shortest stack with just five players remaining, and only three spots were to be paid today. It looked gloomy for me. I had that awful feeling of foreboding that I was going to be either bubble boy or bubble to the bubble. I clamped down tight on starting hand requirements. With the blinds becoming huge relative to everybody's stacks, the chip lead was bouncing around the table, except for me. Finally, two huge hands collided, and one big stack knocked out another, putting us on the bubble. At that point, somebody proposed a $75 save for the bubble boy; i.e., whoever went out next would get his entry fee taken out of the prize pool and returned to him. My stack was much, much shorter than the other three at this point, so I readily agreed to it. I would not ordinarily do so if I had a dominant or even reasonably competitive position, with somebody else's stack as crippled as mine was. Poker is not a game in which showing mercy is rewarded. But I was not the one to take advantage of the save. I picked a couple of good spots to get the chips in and doubled up twice. Then I was the one to bust the bubble boy on my left, and we were in the money. It was not immediately obvious who was ahead. All three stacks were comparable to a quick visual inspection without an actual count. We could guess that we all had between 60,000 and 70,000, and the limits were now 8,000 and 16,000--meaning that we all had around four big bets remaining. That in turn meant that it was almost purely luck as to who would go out in which position if we kept playing. I might get the $650 for first place, or the $390 for second, or the $260 for third, all with approximately equal likelihood. With that understanding, we all quickly agreed to an even chop of the prize money. We decided that whoever had the biggest stack by actual count would get the odd extra dollar. That turned out to be me. I had 68,500 and both of the others were in the low 60s. So I'm just gonna go ahead and say that I won the tournament. That's my story, and I'm sticking to it. I got $434, the other two $433 each. We each put $20 into the dealer tip pool. It was quite a ride, going from hitting everything early, to stagnant for a few hours, to critically short, to a miraculous rebirth just in time for the payout. It was kind of like, oh, I dunno, riding a bucking bronco? I'm not about to commit to making this a weekly affair. But I'm pretty well convinced that there is a lot of value to be mined, if one can tolerate the large variance due to the luck factor, and I think I will keep it in mind for semi-regular sampling. *Given the venue, the type of game, and that description of the most common players, you might form a general impression of the typical player demographic. You would be correct. At age 51, I was easily the youngest among the final five left in the tournament, and there were no women among the final ten or so. This is a geezer game. Apparently somebody at Card Player magazine saw my post from yesterday and took a stab at fixing some of the spelling and punctuation problems I listed in their news story. But while I identified where the problems were, I did not specify what the correct form should be, leaving the staff writers at Card Player to figure this out for themselves. This task proved to be too much for them. They corrected the two instances of it's where its was called for. They apparently still haven't reset their clocks, and left "PST" (for Pacific Standard Time) unchanged. They corrected getting the run around to getting the runaround. But the best part, the one that made me literally LOL, was this: They "corrected" back peddled to back-peddled! Who are these people, and how did they ever get jobs in the writing business? Does Card Player magazine have any copy editors? By all accounts, it appears the tour has taken it’s [sic] ball and gone home. Maybe my post title asks the wrong question. Maybe it's too ambitious. Maybe I should instead ask, "Did anybody at Card Player magazine manage to pass fifth-grade English?" 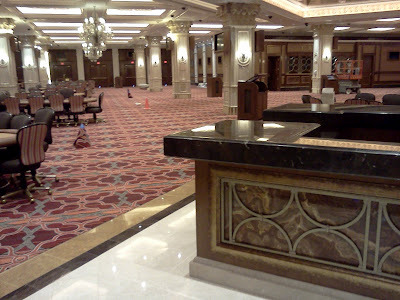 Sunday I reported about my first visit to the new Ellis Island poker room. It's a good thing I got there when I did. Without warning, the room has already been closed down. It may not be immediately obvious, but the two shots were taken from nearly the same spot. 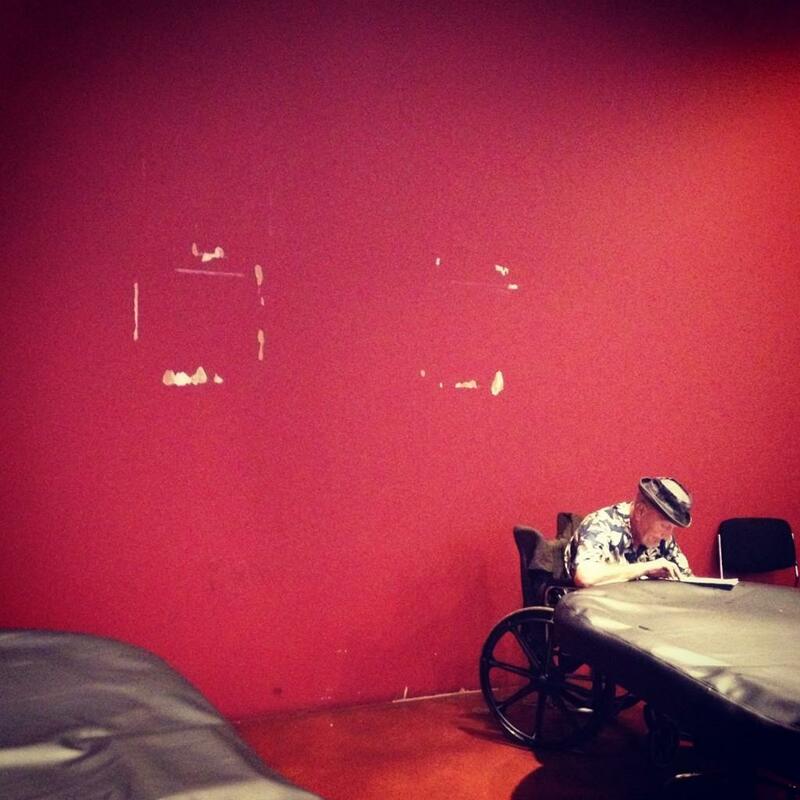 Now, however, both tables are covered and the signs on the wall have been ripped down. 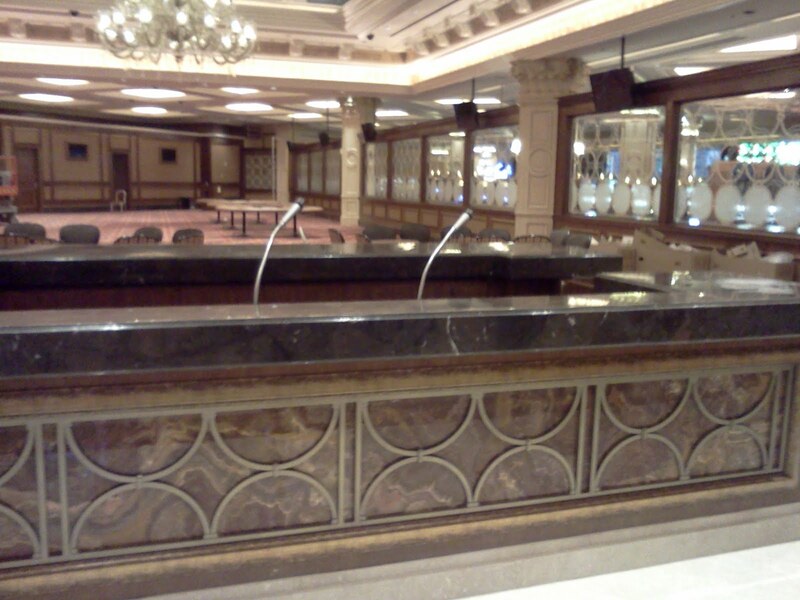 Gone are the days when, in order to have a successful poker room in Vegas, all you had to do was build it and they would come. Now you have to do marketing, compete for business with the 50+ other rooms offering basically the same thing, and give potential customers some reason to pick your place over the others for their poker games. Ellis Island utterly failed to do so, and suffered the inevitable consequences. Tonight was the first time I've been back to the Palms since I tried their new poker room and didn't like it, which was back in May. I go even to places I don't like once in a while for variety and to keep an eye on what's going on and what may have changed. I took my seat, folded the first two hands I was dealt, then saw 2h-4h on the third hand. OK, let's play! Fortunately, I don't think anybody was watching me. I was first to act and checked. This was not a straightforward decision. On the one hand, I obviously want to get as much money into this pot from as many opponents as I can. On the other hand, when one has the board so utterly crushed as this, it's difficult for opponents to have enough of a hand that they're willing to proceed. I decided to check, not so much for purposes of deception, but to allow a free card and hope that it gave somebody a strong flush, a full house, trips--anything that they'll feel comfortable betting on. Fortunately, as it turned out, one guy had pocket 3s and had flopped a set, which was enough for him to start the action with $11. Two people folded. I called. 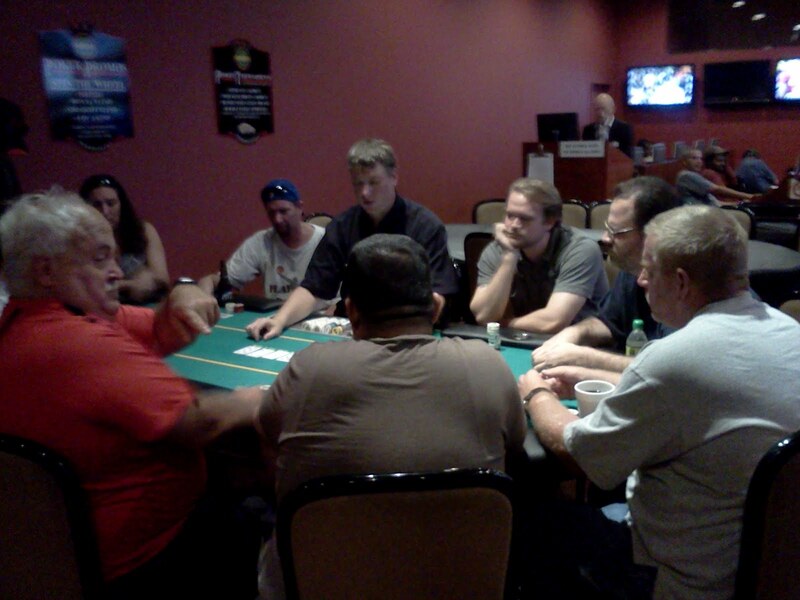 With the 7d on the turn, he bet $11 again, I check-raised to $30, and he called. I led out with $50 on the river and he folded. Dang. I probably could have gotten his whole stack if the board had paired, giving him a boat. Oh well. It would be unseemly to whine about the results. I won the pot plus a $100 high-hand bonus. I think this is the fifth time I've flopped a straight flush during my years in Vegas, plus several more picked up on later streets, though those are not as dramatic. (But still no royal, dammit! This baffles me. I'm definitely due.) The other four flopped straight flushes were recounted here, here, here, and here. With three of those, there was no possible combination of cards that any opponent could hold with any cards coming on the turn and river that would beat me; I had an absolutely lock on the hand, the mortal nuts. But with today's, as with one other time, I could theoretically end up beaten. If an opponent held two cards from the 6, 7, 8, and 9 of hearts, and the other two from that group of four came, I could get one of the worst possible bad-beat stories, having my flopped 5-high straight flush crushed by a 9-high straight flush. I was, however, not too concerned about that happening. Incidentally, the dealer said this was the first time he had dealt a flopped straight flush. Despite this, I still have some readers who doubt the power of the Mighty Deuce-Four. Like, for example, this nutjob, who tweeted to me last night, "2-4 is garbage." WHAT MORE MUST I DO TO CONVINCE YOU PEOPLE??? 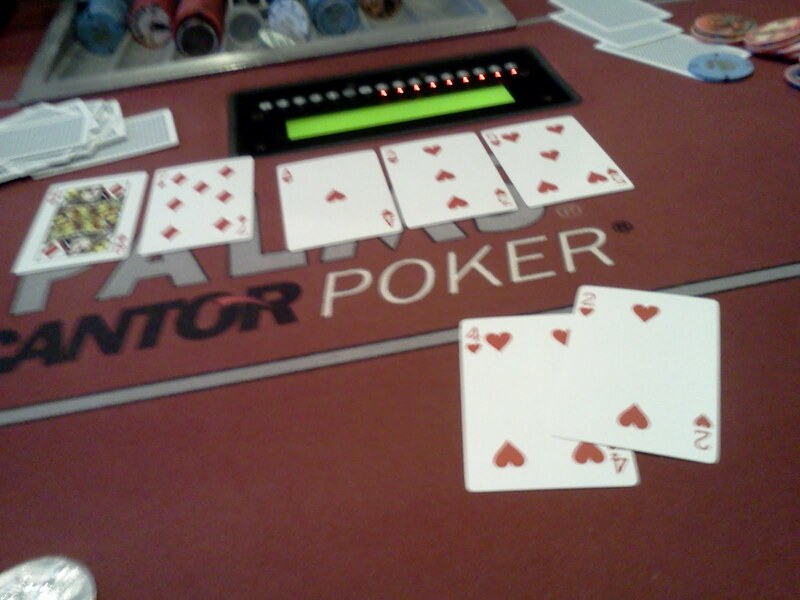 Flopping a straight flush feels really good. 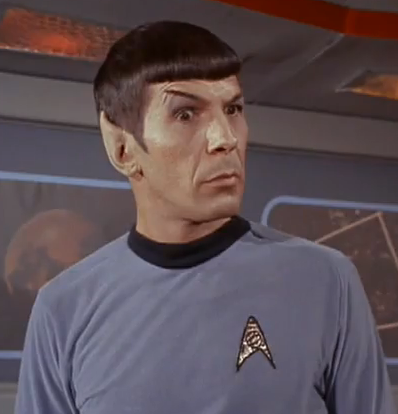 But I've gotta learn to keep those eyebrows under control. Long essay in The New Statesman, by David Flusfeder, "Las Vegas: The last honest place on earth." But all poker players, at whatever level, are used to bad beat stories. Like dreams, the only reason you put up with other people telling you theirs is that it then gives you the right to bore them with yours. Hat tip to Anthony Holden's Twitter feed for pointing me to this piece. Yesterday I put in a marathon poker session at the Venetian. I came away up by a couple hundred bucks, but other than that there isn't much to report about it. However, in the middle of it I did have a memorable entertainment interlude. There are four shows on the Discovery Channel that I watch regularly: Mythbusters, Dirty Jobs, Sons of Guns, and American Guns. The last two are, oddly, both reality shows about gunsmith shops, the former in Louisiana and the latter in Colorado. Both places create custom firearms and do restoration work on classic and antique guns. I like tinkering with my own guns (mostly Glocks and Smith & Wesson revolvers, which hardly qualifies me as a proper gunsmith, since those may be the two easiest kinds of guns to work on), so I enjoy watching these programs. I actually found the show a tad disappointing. It wasn't terrible, but it was kind of ho-hum. Being an avid fan, I've seen all the outtake compilations and many, many interviews with the principals. 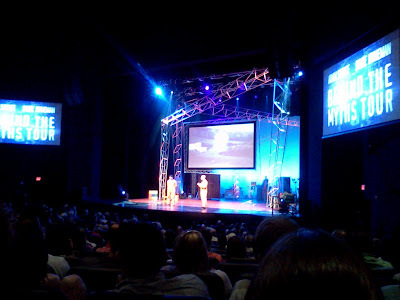 A good portion of the stage show is video montages and audience Q&A, and I don't think I heard or saw anything that was new to me in those segments. 1. Blendo was on stage. Blendo was a bot that Jamie and Adam designed and built in the early days of the fighting-robot craze. It was one of the first to be really, really violent to its opponents, so much so that after a few appearances, show organizers realized that the thing put audiences in danger, because the early arenas did not have sufficiently strong containment mechanisms. Blendo spun hardened steel appendages really fast, and they ripped huge pieces off of opponents' machines, hurling them in all directions. Here is a YouTube video from 1997 of Jamie and Adam being awarded the heavyweight championship of Robot Wars without even doing a single match, because the organizers could not ensure the safety of the gathered crowd, so menacing a machine was Blendo. Blendo was a real benchmark in the development of fighting robots, and it was neat to see it there on stage. Incidentally, Jamie mentioned last night that Blendo was how they got introduced to the producer of a documentary on fighting robots, which led to their later collaboration to create Mythbusters. 2. They had a sound system installed by Dolby Labs with mega-enhancement of the lowest frequencies, so that when they played a montage of explosions done on the TV show, the audience members got a better visceral sense of the body-shaking reverberations that one would experience seeing them go off in person. 3. Jamie had built a four-barrel paintball machine gun about the size of a VW Beetle. They put a brave audience member inside Adam's own medieval-style knight's armor, and unleashed hundreds of paintballs at him in an unbelievable barrage. If you don't find that entertaining, I don't think we can be friends. It's not a show I would be interested in seeing a second time, but I'm glad I saw it once. While I was waiting for my two companions to arrive, a familiar face passed by me. It took me a few seconds to place where I recognized him from--you know that sense of disorientation when you see somebody you know in an unexpected context. Was he another poker player? A dealer? Somebody I used to know in Minnesota? Nope. 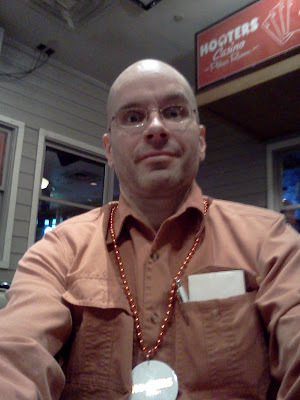 Then it dawned on me--it was Joe, one of the gunsmiths on "Sons of Guns." (And, actually, my favorite of the bunch. He is quiet, shy, cerebral, and methodical, kind of like Jamie--not your usual reality show personality.) I saw him sit down at a bar a few steps from where I was standing, and then quickly realized that two of the people he was with were Kris and Stephanie, also from the show. Kris is another gunsmith. Stephanie is the receptionist/bookkeeper. She is also the daughter of the shop's owner, Will Hayden. She and Kris got married--in Las Vegas--at the end of the second season. (Because of this, I think the show should now be titled "Son-in-Law of Guns." But they didn't ask me.) Stephanie also happens to be an experienced shooter in her own right. She has designed several "package" gun modifications to appeal both stylistically and functionally to the tastes and needs of female shooters, which Will tends to dismiss with a sneer until he realizes how big that potential market is. I don't usually bother famous (or even semi-famous) people when they're out in public on their own time, i.e., not in a deliberate meet-and-greet mode. In fact, I don't think I've ever done so before. But on a whim last night I decided to approach and ask if I could snap a photo of them. They were incredibly nice and accommodating. They wouldn't just let me take their picture. Kris said, "It's weird if you do that without being in the shot." 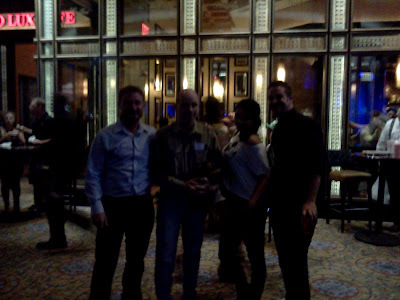 So they recruited a passing cocktail waitress to handle my cell phone camera (which, sadly, is really crummy). The first shot was nearly black because of the dim light, so then they insisted on staging it again where the light was better. I was by this point highly embarrassed to be intruding so much on their time, but they wanted it to turn out right. 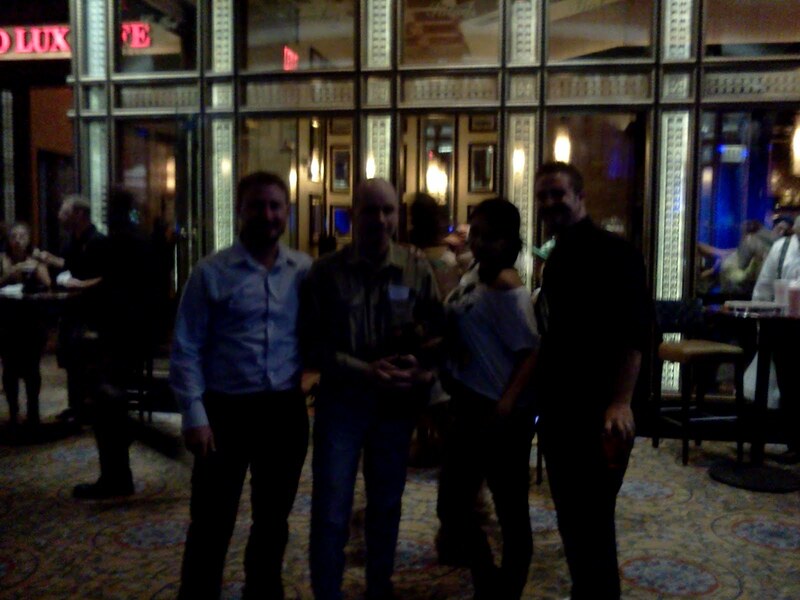 That's Joe, me, Stephanie, and Kris. And yes, Stephanie's breasts did brush up against my arm, so I've got that going for me, which is nice. I know you're all jealous. I assumed that their presence near the Mythbusters show was no coincidence. I asked if they were involved somehow, and they said no, just there to watch. Their presence in the audience was mentioned in passing from the stage, but as far as I could tell they weren't involved in any other way. 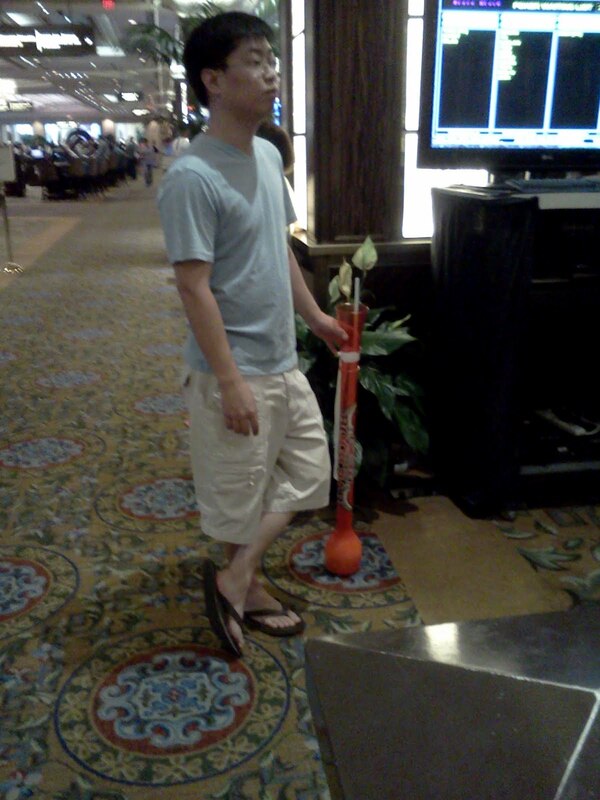 Of course, I've seen these enormously long booze glasses around town many, many times before. But I've not previously stopped to contemplate the physics of drinking from one. He was intermittently sucking on that gargantuan straw that's sticking out from the top. It seemed to take him a long time to get any of the liquid. This strikes me as a really bizarre and difficult way to get a drink. You have to create enough negative pressure to evacuate a large volume of air above the liquid before it will rise to your mouth. This seems to require sucking some air out, pinching off the straw, exhaling, sucking again, etc. All for the "pleasure" of consuming a large quantity of alcohol from an absurdly designed, impractical souvenir vessel. Add this to the list of peculiar things about Vegas that I just don't get, even after six years of living here. I was at the Venetian today. 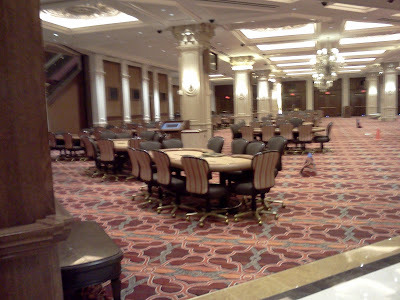 I wasn't sure whether they had moved the poker room back to its original location after a few months in a temporary spot next door at the Palazzo, so I swung by the old/new location. It wasn't open for business, but they're obviously getting close. A sign in the temporary room at the Palazzo says that the refurbished room will open on the morning of Wednesday, September 5. 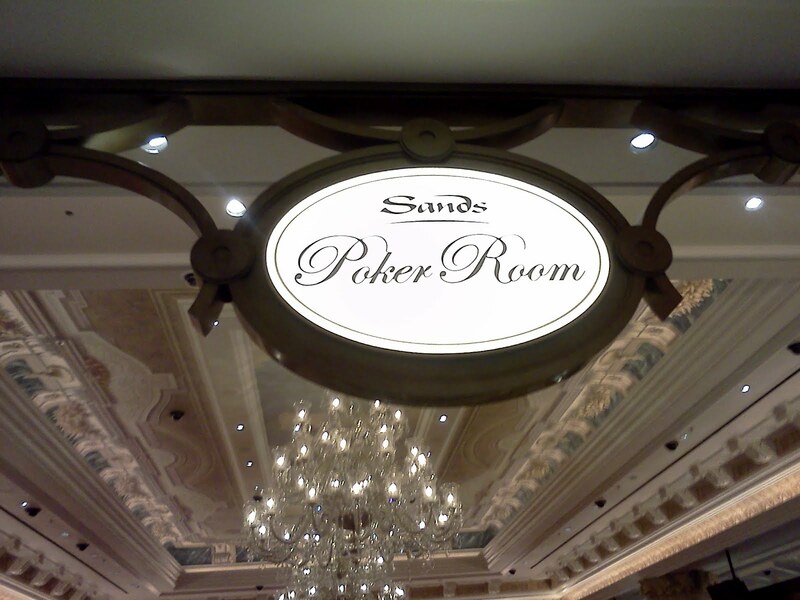 Oddly, it appears to have been renamed the "Sands Poker Room" rather than the "Venetian Poker Room." I have no idea why they would do such a dumb thing. 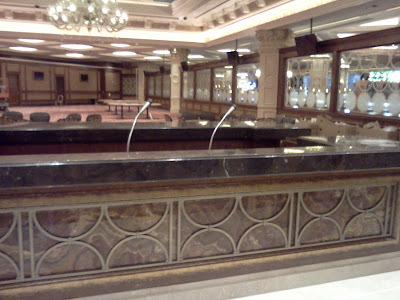 I mean, I understand that the Venetian is where the Sands used to be, and that the corporation that runs it is Sands. But why put that name on the poker room? Makes no sense to me. I was just talking to my very clever girlfriend about this odd "Sands" thing. She posited that this is in anticipation of legalized online poker. I.e., the Sands Corporation is going to operate an online poker site, and they want their brick-and-mortar poker rooms around the world (just two so far that I know of, Venetian and Macau, but one would guess that they have other long-term expansion ideas) to be recognized as part of the same entity. This makes sense, as we anticipate that Nevada-licensed online poker rooms will allow use of their brick-and-mortar casinos for online account deposits and withdrawals, so there is some benefit to being sure people recognize them as extensions of each other. I find this to be a pretty plausible hypothesis. 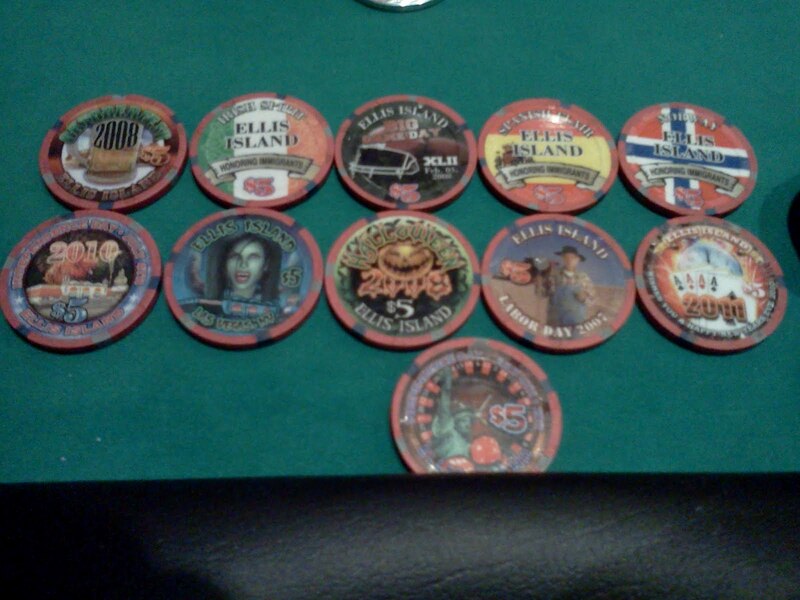 I just listed for sale on eBay my set of Hooters poker chips. If interested, you can see the auction here. Ellis Island is a little casino just off the Strip on Koval, south of Flamingo. I've been there a few times because they have a tasty and inexpensive barbecue restaurant with outdoor seating (and their own microbrewery, for those who like that sort of thing), which is a great place to take visitors from out of town. A couple of months ago they opened a two-table poker room. I hadn't played there until last night. 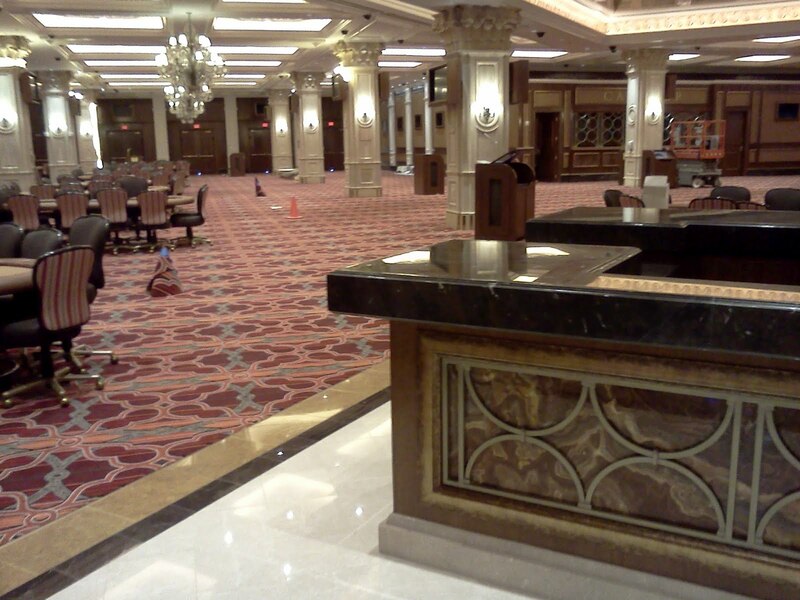 I think that's the longest that a new poker room in Vegas has been open without me hitting it up. I just kept forgetting it was there when selecting a place to play. The game going was $0.50/$1 NLHE. The players were predictably terrible. It was a lot like playing at Bill's, the only other joint in town that has a game of that structure. I'm in the process of reversing the flow of chips in my life, so I took this picture instead of taking one of each home, as would have been my previous practice. They have a $50 aces-cracked bonus anytime the room is open, rather than just certain hours, like other places do. Some will find that a plus. Personally, I hate it because of how it distorts the game. I had aces once last night, and played it as I usually would, winning a pot of maybe $40 or $45. I was roundly criticized for not playing more passively and going for the bonus. Sorry, that's just not how I do it. They also give you, after one hour of play, a coupon for a submarine sandwich at the newly opened Boardhouse Sandwich Shop. Nice touch. I won't have much reason to go back. As long as it's basically like playing at Bill's, which is just a stone's throw away, I'd rather be at Bill's. Bill's has games going more consistently, easier access and parking, earns you points in the Total Rewards program, and it's easier to move on from there to other poker rooms (Flamingo, Bally's, Caesars).